The 4 tools every quilter must have. We all have our favorites, but what tools do you really need to make a quilt? . In fact most of us have multiple tools to do the same thing. In my opinion these are the the five tools every quilter needs to make a quilt. 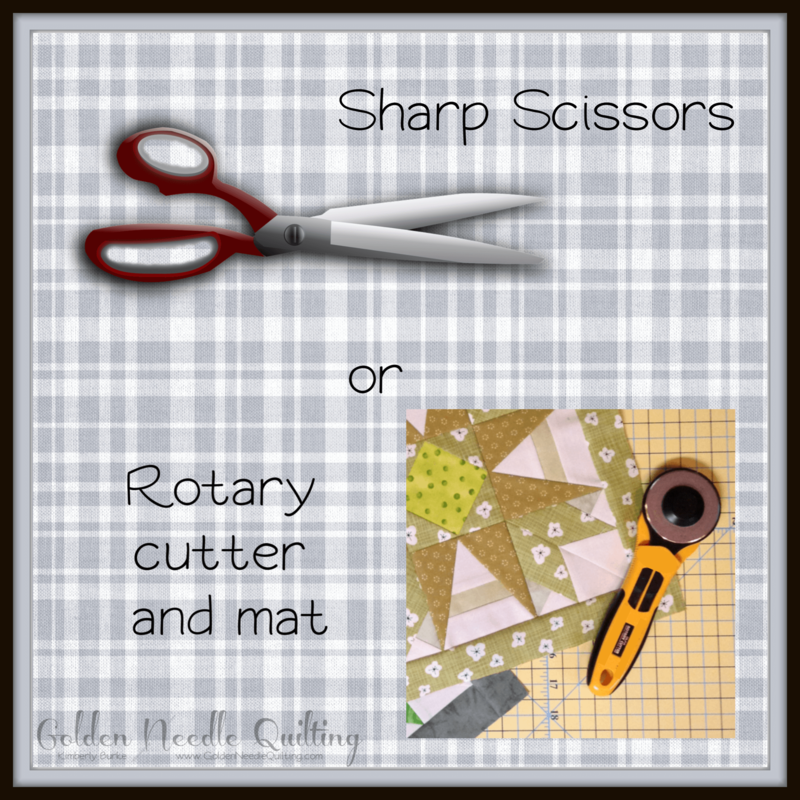 Scissors or Rotary Cutter & Mat? Technically this could be one or two items depending on the method chosen. In order to cut your fabric you’ll either need scissors or a 45 mm rotary cutter with mat. While rotary cutters and mats are the preferred method it’s really not required but well worth the investment. Purchase the best you can as this particular item will serve you for decades if maintained properly, but don’t go crazy if you aren’t positive quilting is for you. Quilter’s can always upgrade their tools later. I’ve been quilting for over 20 years and I’m only on my 3rd cutting mat. I have the original rotary cutter (with a new blade). I still have my original scissors but prefer a different pair now. Again if maintained they’ll last for quite awhile. You’ll need either a ruler or a template. Rulers are more versatile as you can use it to draw or cut nearly any shape and size. A template limits you to a specific size and shape most often. If you’ve chosen to use scissors simply use the ruler or template to draw your cutting line on the back of your fabric. If you’ve chosen a rotary cutter you’ll use the edge of the ruler as your cutting guide. I recommend this ruler for beginners as it’s very versatile. Quilting templates also come in a wide variety. I recommend Marti Michel’s quilting templates. This link will give you a nice variety to chose from. Whether you are sewing by hand or machine you’ll need a sharp needle. 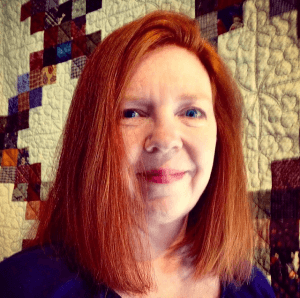 While I’ve never attempted to stitch by hand many quilters do and Kristin Esser of Simple. Handmade. Everyday. makes it look so easy to learn in her terrific series of YouTube videos on hand piecing. She has multiple quick videos covering notions, marking and more. If you’ll be piecing using a sewing machine I recommend a Schmetz Microtex Sharps 70/10 needle. I started off with a Schmetz Universal 80/12 and they work fine so use those if you already have them on hand. Thread can be a hot topic among quilter’s! No joke! Todays threads are not the threads our Mother or Grandmothers were using. (By the way throw out those old threads!) Bob Purcell of Superior Threads offers a wider variety of articles, videos and reference guides on their website, under the Education tab. For hand piecing Kristin Esser recommends trying a few different needles to see which works best for you . She mentions a few options in her video. For machine piecing I prefer Superior Threads Masterpiece or Aurafil’s 50 wt Mako Cotton. Both threads are terrific to work with and offer a wide selection of colors. I suggest starting off with a light beige or gray as it blends well with multiple colors. Whether you find yourself living in the midst of a giant metropolis or living in the sticks there will be a quilter nearby who is eager to share their skills and know how with you. Reach out at a local fabric store, ask in a local Facebook community group or search YouTube for help. Of course you can always send me a message and I’d be happy to help you find the type of help you need in your area or on YouTube. We all start somewhere and this small selection can get you on your way to piecing your first quilt top. Quilter’s are a friendly bunch and we are always eager to share! Previous Post: « Why do I quilt?